In Oxford metallic green with green and black leather interior. 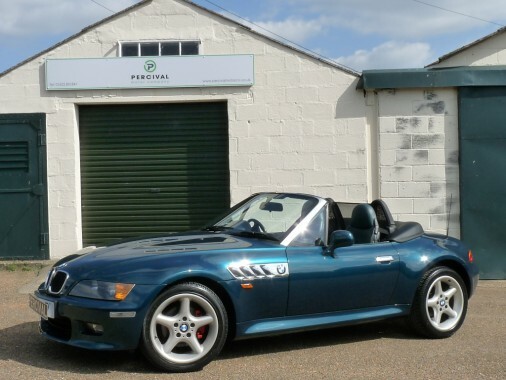 This very high specification Z3 has covered only 37,000 miles since new with service history to verify this. The same family have owned the car since 2007. It is the face lifted, wide bodied version. The BMW is equipped with a 2.8 litre, six cylinder engine and a five speed , manual gearbox and has a electric hood with a hard tonneau, air conditioning, heated seats, five spoke alloy wheels, and an air deflector between the headrests to reduce turbulence when the roof is down. It has the rare option of chrome windscreen surround, chrome air vents on the wings and chrome door handles. The six cylinder engine is smooth and powerful and the car runs beautifully. It is MOT'd until March 2018 and comes with the original Dealer Pack and Service books.